The SaltDogg TGSUV1B 4.4 Cubic Foot Tailgate Spreader is a simple and effective tool for residential spreading of #1 free flowing rock salt. With its compact size, hitch mount design, and auxiliary power plug adapter, the TGSUV1B makes it easy to spread with an SUV or a 1/2, 3/4, or 1 ton truck. It features a corrosion-resistant 4.4 cubic foot poly hopper. The hitch mount is compatible with 1-1/4 in. or 2 in. Class 3 or 4 receivers, and can fold away for easy tailgate access. The gravity-fed spreader has a manual open/close gate and a 9 in. poly spinner that can cast up to 14 ft. Its 1/8 HP, 12V motor is powered via an auxiliary plug connection with a manual on/off switch. Overall Width (at top): 22.50 in. 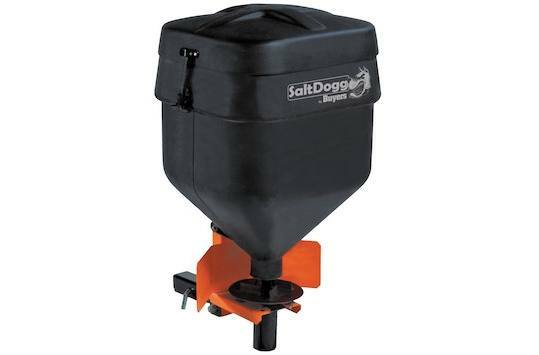 Spreading Width Range: 12 To 14 ft.
Hopper has 4.4 cubic foot capacity to hold up to 331 lb of salt. Easily mounts to an SUV or a 1/2 ton, 3/4 ton, or 1 ton truck. Simple 1-1/4 in. or 2 in. hitch-mount design. Uses #1 free flowing rock salt. 9 in. poly spinner can broadcast up to 14 ft. Included on/off manual switch control.